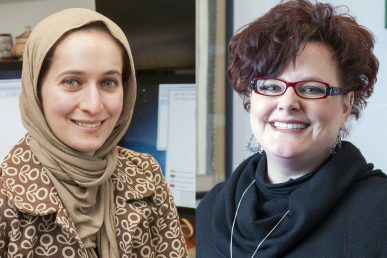 University of Illinois at Chicago professors Dima Qato and Shannon Zenk have been named to the Robert Wood Johnson Foundation’s Clinical Scholar Program. The Clinical Scholars program is a leadership development opportunity for practitioners from diverse fields in health care. Scholars form interdisciplinary teams of clinicians that collaborate across sectors, tackling complex health problems in their communities, and building a “Culture of Health” across the United States. Qato, assistant professor of pharmacy systems, outcomes and policy in the College of Pharmacy, and Zenk, professor of health systems science in the College of Nursing, will attempt to reduce the burden of pharmacy closures on access to essential medicines for residents living in pharmacy desert communities on Chicago’s West and South Sides. “Addressing the problem of pharmacy closures in these communities is important considering the scope of pharmacy services — particularly for retail chains — is expanding beyond dispensing medicine to provide preventative care, such as immunizations, and the emergency treatment of opioid overdoses,” Qato said. In partnership with local pharmacies, community health centers, and community health liaisons, Qato and Zenk will establish a “pharmacy referral service” where prescriptions are filled and then delivered to patients in need. If preferred, patients can also request transportation services to and from a local pharmacy. In order to strengthen their capacity to influence policy and population health, the two UIC professors will assemble an Access to Medicines Advisory/Advocacy Committee (AMAAC) that includes stakeholders from both the public and private sectors, including pharmacy retailers. In collaboration with local public health and policy officials and community residents, the AMAAC will advocate for legislative changes that prevent closures from occurring in at-risk communities. A series of town hall meetings is also planned. “By engaging with the community and key stakeholders, we will gain a better understanding of how specific policies and regulations of the city of Chicago, such as Tax Increment Financing, influence decisions on the opening and closing of pharmacies across Chicago’s segregated communities. Our goal is to promote greater transparency and accountability of the impact of such policies on barriers in accessing and adhering to prescription medications at the local level,” Zenk said. “Ultimately we hope to increase awareness of the critical, yet often ignored, role of pharmacies in ensuring healthier and more equitable communities in the United States,” Qato said. Along with Qato and Zenk, Melvin Thompson, executive director of The Endeleo Institute, a faith-based community organization on Chicago’s South Side, will assist in the project. The Robert Wood Johnson Foundation (RWJF) is the nation’s largest philanthropy dedicated solely to health. Founded in 1972, the foundation has supported research and programs targeting some of America’s most pressing health issues — from substance abuse to improving access to quality health care.